Smooth, creamy fudge set in an adorable mini cupcake liner and topped with more creamy dreamy fudge swirls on top to look just like a little cupcake! The recipe is so easy using just a few ingredients. Press the mixture into a cupcake pan and then pipe a swirl on top and refrigerate until it's firm and ready to eat! I like to add sprinkles to the fudge mixture for fun, but you can add just about any toppings you like. I created a list of my favorite mix-ins and toppings below, or get creative and come up with your own flavor combinations! Peanut Butter Fudge: Sub peanut butter morsels for white chocolate chips or add 1/4 cup smooth or crunchy peanut butter in with white or semisweet chocolate chips. Butterscotch Fudge: Sub butterscotch morsels for half of the white chocolate chips. Fruity Fudge (strawberry, raspberry, orange, etc. ): Add 1/4-1/2 teaspoon fruit flavored extract/flavoring in white chocolate fudge. Add a drop of food coloring to distinguish color of fruit flavor. Almond Joy: Add 3/4 teaspoon coconut extract in your white chocolate fudge. Top with an almond. Espresso Fudge: Add 1/2 teaspoon espresso powder to white chocolate fudge. Cookies & Cream Fudge: Add 1/2 cup crushed Oreos to white chocolate fudge. Confetti Fudge: Add 1/4 cup rainbow sprinkles to white chocolate fudge. Mix-ins: Add 1/2 cup nuts, toffee, dried cranberries, crushed peppermint, marshmallows etc. to your fudge. Line a mini muffin/cupcake pan with baking cups. 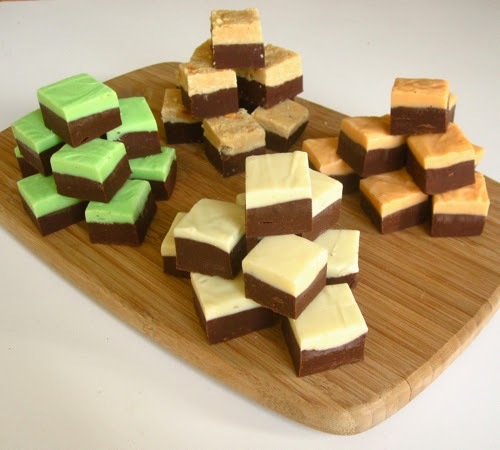 Note: For 2 layered fudge squares, line a 8x8" square pan with wax paper or foil. Make fudge as directed, spreading and layering fudge into prepared pan to chill. Cut into squares once fudge has cooled and set. Melt semisweet chocolate, half the can of sweetened condensed milk (7oz.) and butter in a double boiler or microwave. Add a pinch of salt and 3/4 teaspoon vanilla extract and any desired flavor variations above. Stir until fairly smooth and scoop fudge into mini muffin cups using a spoon or a mini ice cream scoop and press tops flat. Mixture will be thick. Place in the freezer for 30 minutes. Melt white chocolate chips and remaining half the can of sweetened condensed milk (7oz.) in a double boiler or microwave until about half of the chocolate chips have melted. Remove from heat and keep stirring until remaining morsels have melted. Add a pinch of salt and 3/4 teaspoon vanilla extract and any desired flavor variations above. Remove bottom layer from the freezer. Scoop the top layer/white chocolate fudge into a decorating bag and pipe on top for a swirled "frosting" look, or you can spoon it on top, and smooth it with a knife. Garnish with toppings, if desired. 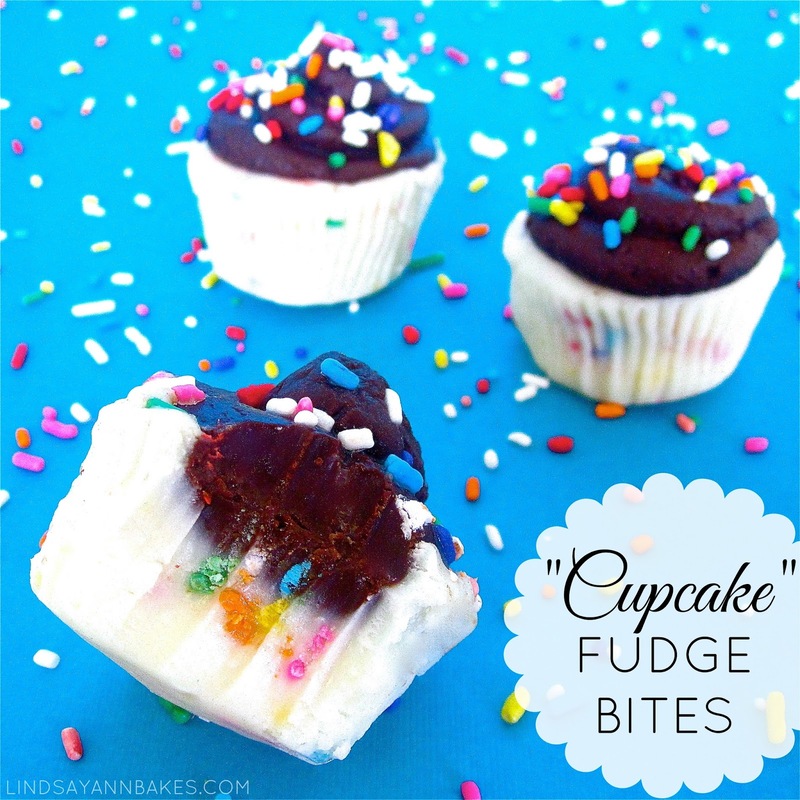 Refrigerate your "Cupcake" Fudge Bites for 2-3 hours, until firm, before serving.